A new MA programme on International Heritage and Law at the University of Kent is now open for applications for the 2017/18 academic year. The MA is a distinct programme combining the study of international heritage with an understanding of the legal frameworks which govern the management of our heritage. It will be of particular interest to those who wish to study cultural heritage as an academic subject, those who wish to pursue a career in international heritage and development, lawyers who want to specialise in cultural heritage issues or heritage specialists who want to acquire a better understanding of legal issues. The programme draws upon staff expertise in the Department of Classical & Archaeological Studies alongside staff from the Kent Law School. Un riche programme pour les prochaines rencontres organisées par le programme Non-lieux de l’exil en partenariat aux dates suivantes : 26 avril, 4 mai, 5 mai 2017. 26 avril 2017 – Passion et engagement pour les exilés : Projections, identifications, transferts, actions. L’exil ne s’oppose pas à la migration, ni l’exilé au migrant ou au réfugié, mais les relie pour privilégier le vécu sur des catégorisations juridiques et politiques conjoncturelles, la subjectivité et la capacité d’action du sujet sur un statut administratif transitoire. Si la figure romantique de l’exilé a fait long feu, celles de demandeur d’asile ou du migrant participent de ses recompositions contemporaines. C’est précisément ces changements de condition, la nécessité de renouveler l’analyse des formes d’accueil et de représentation des sujets en exil dans la durée qui réintroduisent la potentialité heuristique du concept d’exil dans le champ des études sur la migration – et permettent de réinterroger situations, lieux et non-lieux, temporalités et imaginaires. 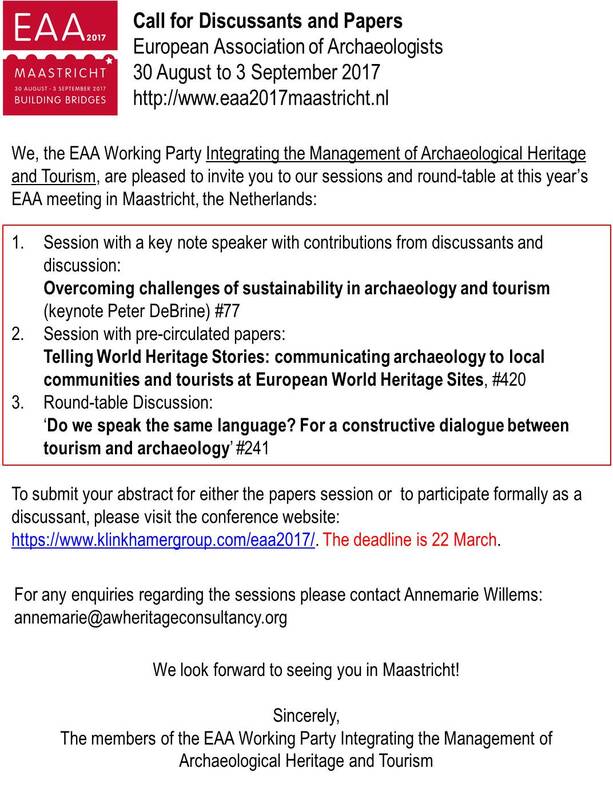 The deadline for submitting paper or poster or other contribution for the 23rd EAA Annual Meeting in Maastricht, 30 August – 3 September 2017 has been extended till 22 March! This means there’s still time to submit an abstract for one of the sessions that member of our WP are organising this year. Sindh Culture, Tourism and Antiquities Department. The broader theme and sub themes of the conference uses the transcultural conceptually and methodologically approach to engage with cultural heritage narratives with special emphasis on syncretic and plural cultural traditions and intellectual cultural histories in Asian contexts and beyond. The deadline for research proposals submission is March 28, 2017. D’un montant de 10 000€, elle sera attribuée chaque année à un(e) étudiant(e) à partir de 2017. Elle est destinée à des étudiants francophones, titulaires d’un master 2 et inscrits en thèse de doctorat, de préférence en première année, et désireux d’effectuer une enquête de terrain de longue durée. Three doctoral fellowships are offered to support PhD candidates in completing their dissertation; candidates must be at least in the third year (post-fieldwork writing stage) of their doctoral program during the academic year 2017-2018 (in a university in France or abroad). This fellowship scheme is notdesigned to fund fieldwork or archival research. It specifically concerns doctoral studies on non-Western societies. The doctoral fellowships are limited to a period of 12 months (non-renewable), from October the 1st to September the 30th of each year. They consist in a monthly allowance which in 2017 will be of 1300 €net and will be awarded after assessment and selection of the applications by the Museum’s Scientific Committee. No condition of nationality applies. Five postdoctoral fellowships are offered to early career scholars to collectively develop a one year research program on the theme “value and materialities”.Each of these terms must be understood in its broader sense to account for all their possible relations, the museum collection being one of its modalities. Thus the economic, aesthetic, religious and political dimensions of value will be considered. These will be associated with different forms of materiality, from objects and places to bodies. The different stages of the valorisation process may be taken together or separately, from the creation/production, to the circulation, exchange, authentication, consumption, conservation or disposal. Insights into the institutional forms of valorisation, such as the market, heritage, ritual or performance will be of equal interest. Beyond the disciplines concerned by the museum fellowships, legal and economic approaches may be included. The postdoctoral fellowships are limited to a period of 12 months (non-renewable), from October the 1st to September the 30th of each year. They consist in a monthly wage of 2 111,09 € gross in 2017. Application forms can be downloaded from our website (http://www.quaibranly.fr/en/scientific-research/activities/scholarships-and-thesis-prizes/research-fellowships/). The list of all the candidates whose application is eligible will be posted on the museum’s website on the 10th of April 2017. The candidates shortlisted for a post-doctoral fellowship will be contacted mid-June and an interview organised at the end of June. The list of names of the successful candidates will be posted on the museum’s website during the first week of July 2017. For legal and archival reasons, mail transmission is also required, in addition to electronic transmission.